This week, we take a trip back to the past as Violet goes on her own private trip to confirm or deny the death of her beloved Gilbert. — The first time Gilbert met Violet, he instinctively pulled her into his embrace and away from his brother’s abuse. How is it that two brothers can be so different in temperament? I know this is not uncommon. 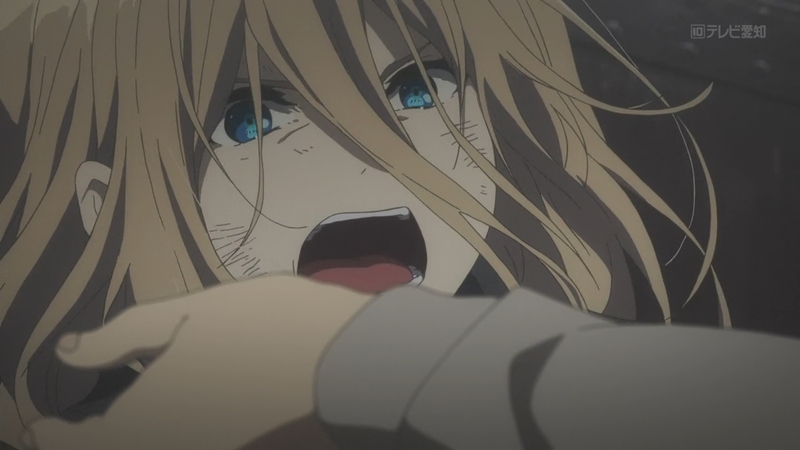 I also know Dietfried had to watch Violet kill his men in cold blood. 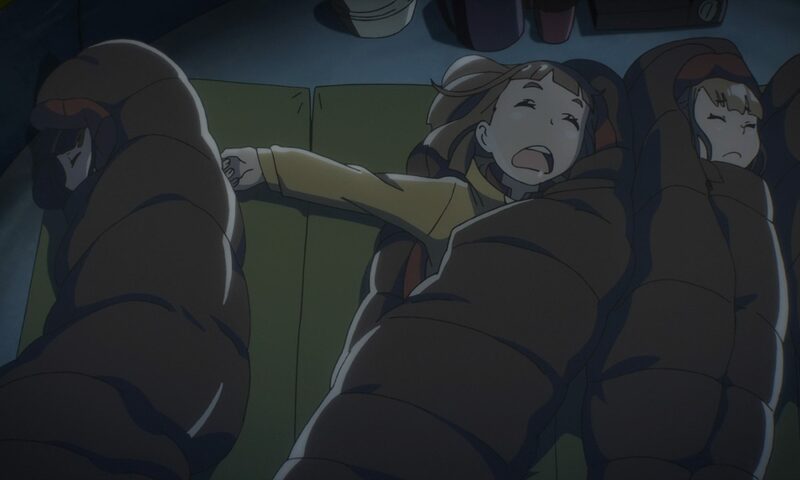 But at the end of the day, she was and still is just a child, right? Then again, children didn’t exactly have rights back then. Dietfried also didn’t (and still doesn’t) see her as a person; he called her nothing but a tool of war. If she was actually an android, I could see his point. But he broke eye contact with his brother as he dehumanized her. This suggests to me that he didn’t even wholeheartedly believed what he was saying. — I dunno, though… Is Violet really human? She’s certainly stronger than any normal 14-year-old girl I’ve ever seen. 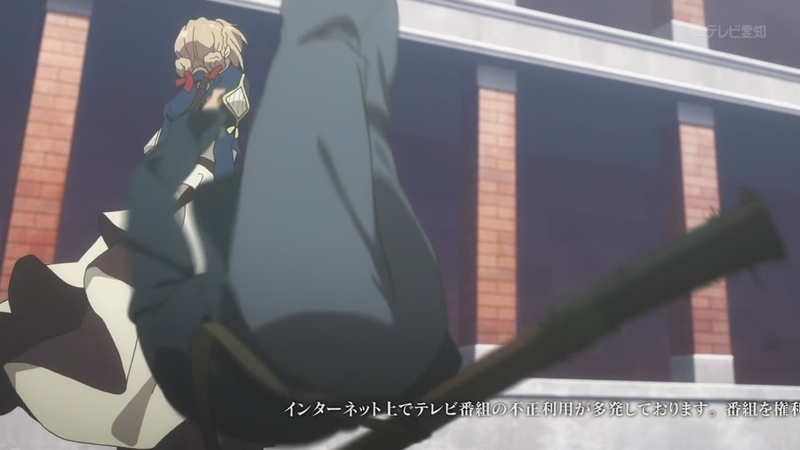 I don’t care how much training you’ve had in the army, because there’s no way any normal human teenager can just flip a grown man on his backside with just one hand. — I’m still puzzled as to why Gilbert kept Violet with him on the frontlines. Hopefully, this episode will explain everything. — I also hope that Gilbert loved Violet as a younger sister or perhaps even a daughter and not… y’know, a lover. On the other hand, we did just watch an episode in which a 14-year-old princess exchanged love letters with a man ten years her senior. Gross. — Dietfried still sees Violet as a threat. We don’t know enough about him at the moment, however, to understand his hatred of Violet. Yes, she killed his men, but it was wartime. Lots of his men have died to more than just Violet, I’m sure. 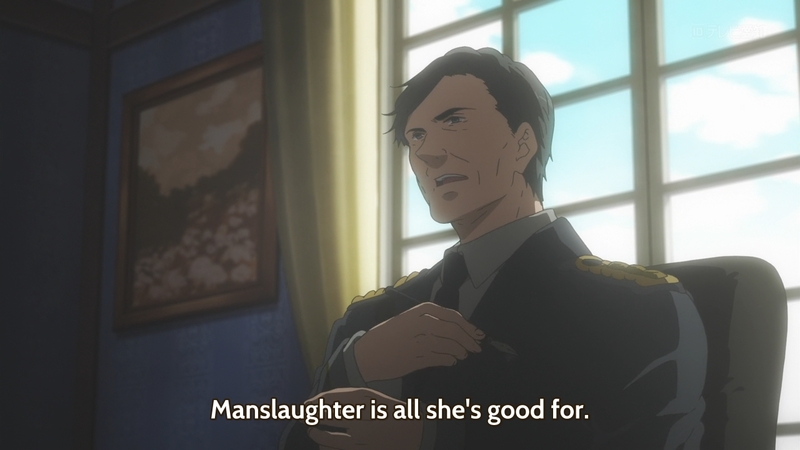 Unless she killed a close friend — or perhaps even a lover — his reaction here seems a bit hyperbolic. 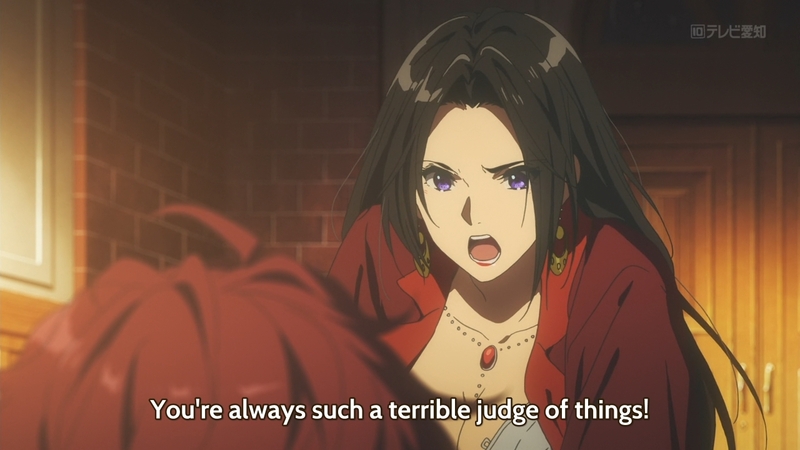 — Apparently, Cattleya doesn’t agree with telling Violet the truth. I think she’s just letting her emotions get the better of her. 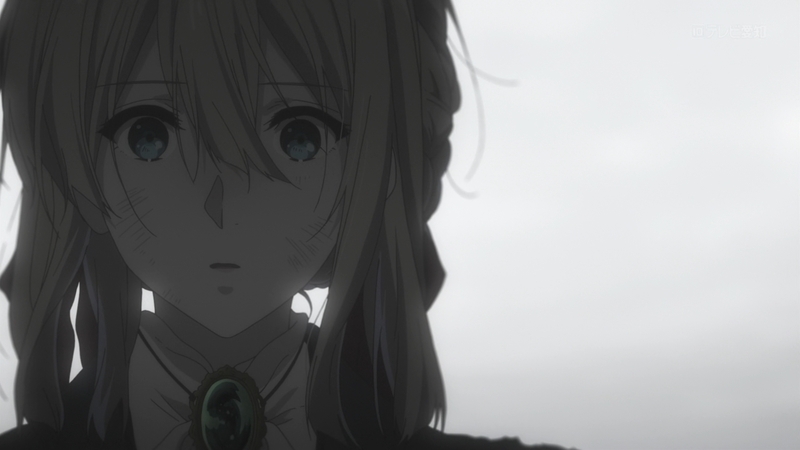 There is no point in which Violet could learn about Gilbert’s death and not be devastated. You can wait and wait and wait as long as you want. She was going to be crushed either way. If anything, the longer she remains clueless, the longer she stays imprisoned by the past. She will never move on with her life if she’s always sitting around waiting for Gilbert to return. — Why did Violet bite the kind, old servant lady? Why didn’t she bite Gilbert the first time he reached out and embraced her? — So he had to take her with him to the frontlines, because the army said so. I was hoping for a better reason than that, but whatever. The story continues to skirt around Violet’s true nature. No one is at all surprised or confused by the fact that a young child is so frighteningly proficient at fighting. Child soldiers are not rare, but they’re not exactly superhuman like Violet either. — We proceed to see Violet perform superhuman feats despite Gilbert telling her to stay put at base. — In the present day, Violet travels all the way back to Gilbert’s home just to look for him, but she is confronted by his gravestone. According to Claudia, however, they never found his body. I wonder if she’ll still cling onto some minuscule shred of hope that he’s still alive out there somewhere. In any case, another flashback seems to imply that the first time she ever spoke to him was when he named her after those flowers. This only raises more questions. Was this the first time she actually learned to speak, read, and write? Aren’t there issues with learning these things if they’ve been delayed too long? I don’t know, actually. I’m not an expert on childhood development. — She’s such a great fighter, she even helped free a city from enemy occupation. And so we finally see the scene where she first got her brooch. Its color reminded her of Gilbert’s eyes, and as such, the jewelry stirred up an incomprehensible feeling within her (most likely love). Violet even confessed that she always thought her eyes were beautiful. Maybe that was why she didn’t bite him when they first met. — We also get to see what Claudia was like in the past, but not much has changed between then and now. 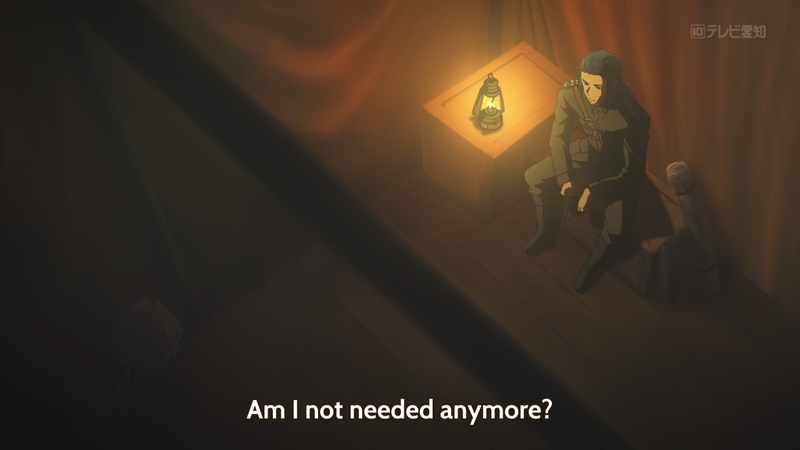 This is also when they first discussed the possibility of finding Violet a job after the war. The girl seemed to sense that something was amiss, but she of course didn’t realize that Gilbert merely wanted to secure a safe future for her. All she ever knew at the time was fighting and following military orders. 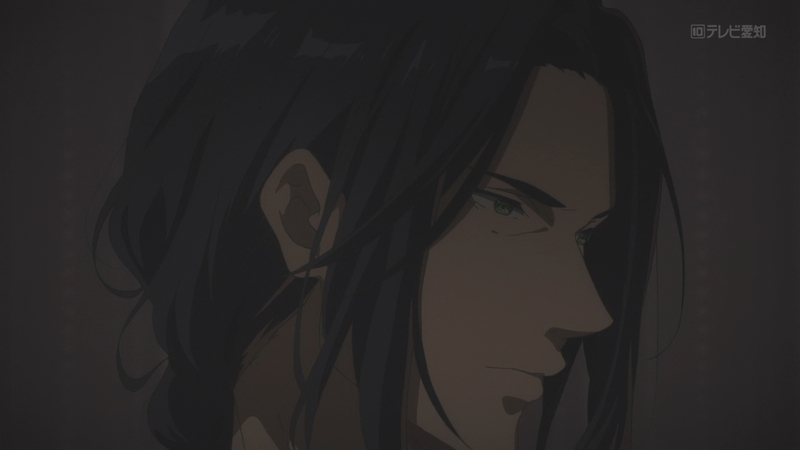 — Claudia also seemed to imply that Gilbert could’ve had the girl removed from the frontlines by now: “Aren’t there other things you could have her do?” Maybe he was mistaken. Then again, maybe he wasn’t. 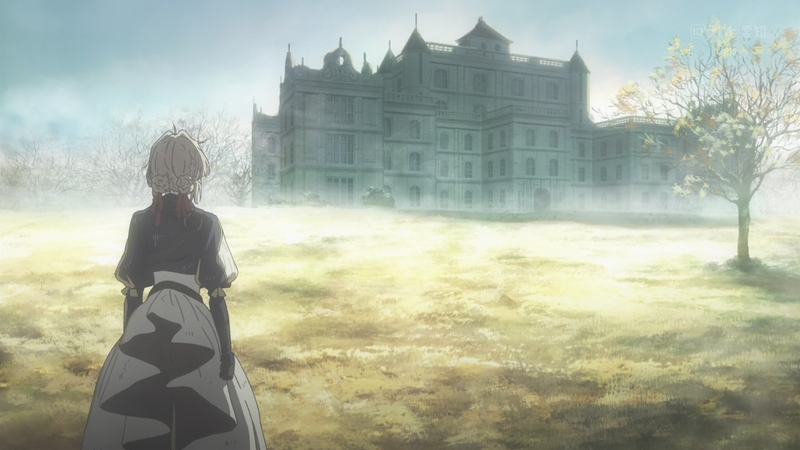 Maybe Gilbert wanted to end the war so badly, he kept her with him for the pivotal battle ahead. It’s hard to blame him. If you knew you could end a war that has taken (I’m guessing) hundreds of thousands of lives, and all you had to do is make a child soldier fight one more battle, wouldn’t you do it? — I don’t have much to say about the wartime scenes. They’re well-animated, but they don’t elicit any emotions from me. 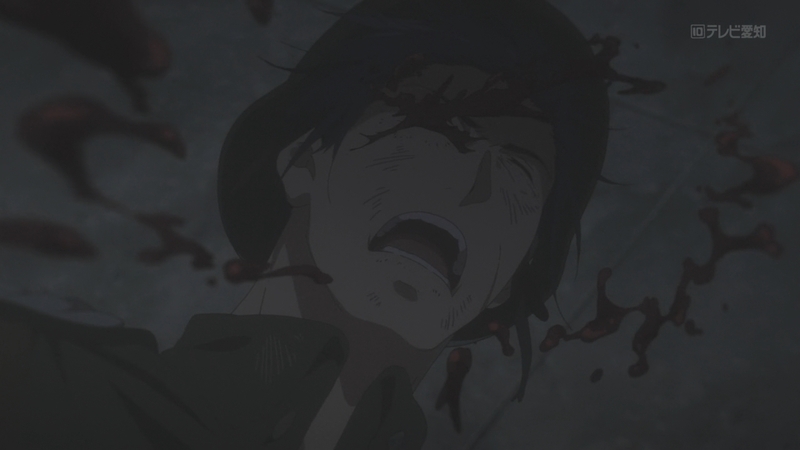 Gilbert got shot in the eye right after he signaled to his allies that the enemy HQ had been secured. Unfortunately, I can’t say I feel too bad about Gilbert, because I still don’t think I know him that well as a character. He was kind to Violet when everyone else treated her like an object, but beyond that, his character remains a blank slate. I still think that Gilbert is alive. 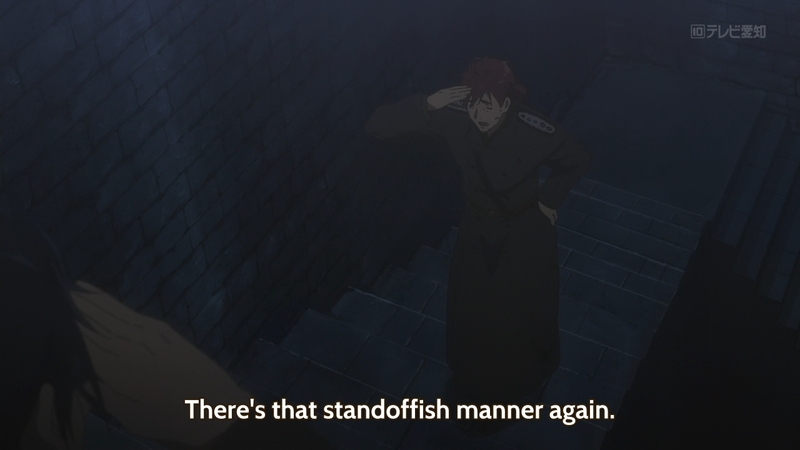 This anime (and anime in general) isn’t subtle or modest with its “moment”. There is no way that the death of a character like Gilbert is going to be just like this. It’s going to be more grand, more melodramatic. He isn’t going to be death until his author can milk it for all its worth. Not to mention that Japanese storytelling is all about the “moment” at the expense of everything else. 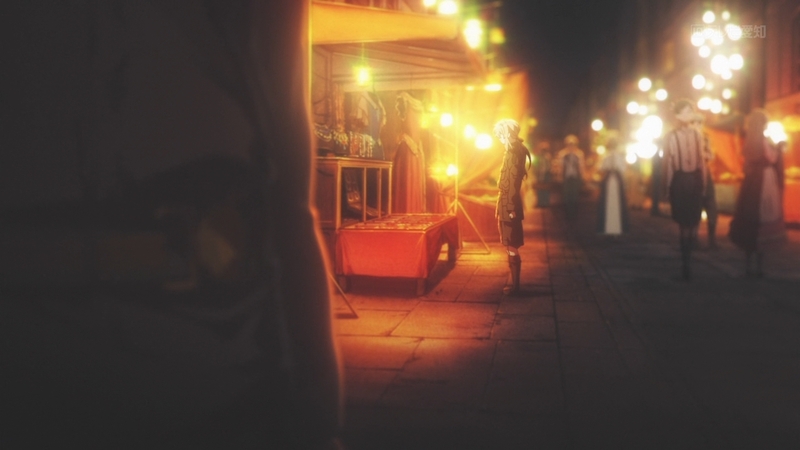 Yeah, this anime seems to be confused whether it’s supposed to be realistic or not. It feels disjointed and makes it really hard for me to immerse myself into its world. The logic of its world just fall apart whenever I try to analyze it. i guess that is why the creators of this anime try really hard to distract me from it with all the FEELS. Other than everything I typed above and I still feel Gilbert is an a-hole that the show will try to make me thing a nice guy by manipulating my emotion or shoving it down my throat, I don’t feel anything. 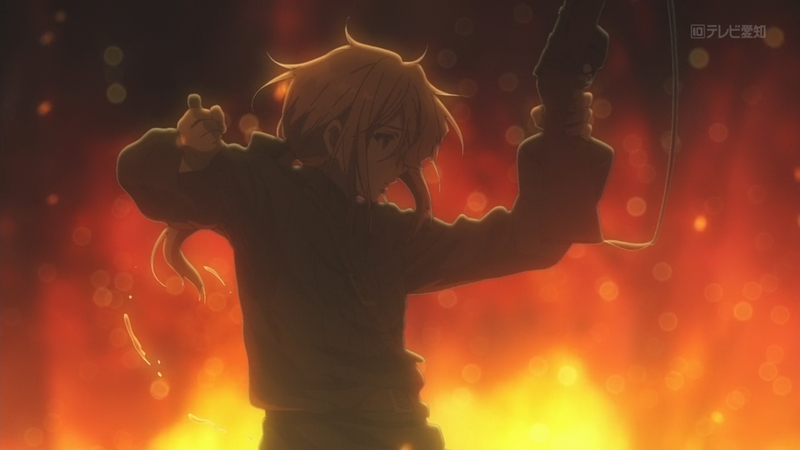 Despite the “supposedly” dark and serious war scenes, this episode is kinda just there. 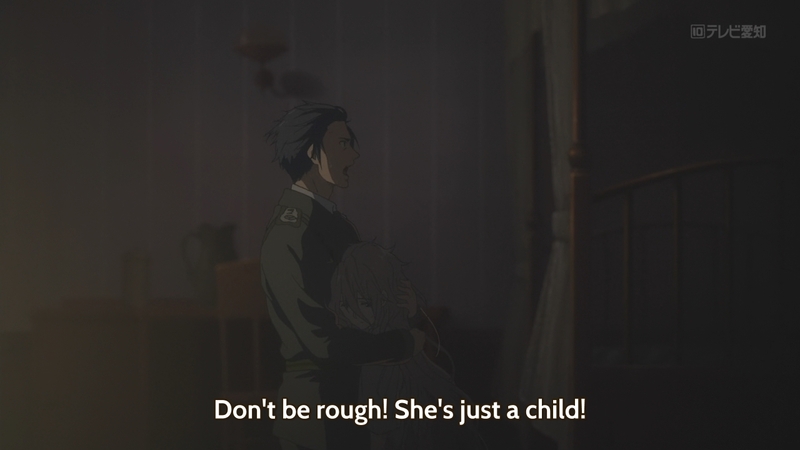 For an emotional anime, this anime lacks soul I guess. 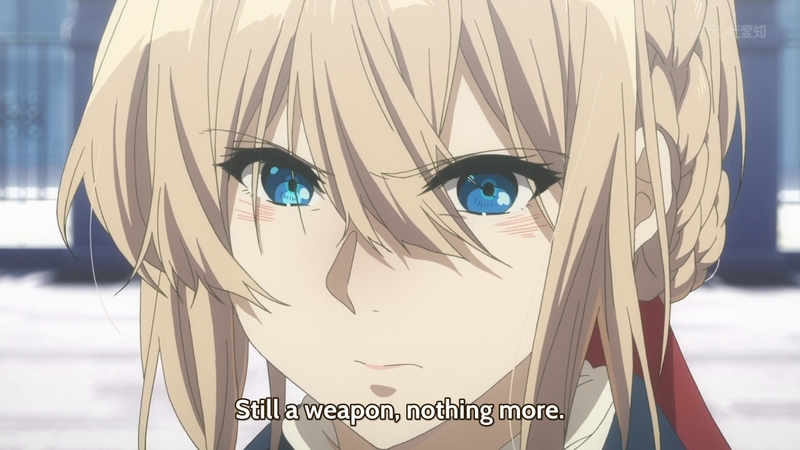 The fact that Violet’s character development seems to happen either off-screen or out of nowhere also don’t help. I seriously think that if there is a segment at the start and the end of each episode, where Violet writes what is going in her mind into a diary or whatever, it’s going to help a lot.